Dogs can suffer from a variety of itchy, annoying skin ailments, just like their human friends. One such ailment is an ingrown hair, which is caused when a hair becomes entrapped and continues to grow within the sheath of the hair follicle without emerging from the surface skin layer. Infected ingrown hairs are a form of superficial bacterial folliculitis -- surface-layer bacterial infection of hair follicles -- which is a form of canine pyoderma, or skin infection. A pre-existing case of pyoderma can cause an ingrown hair by causing tissue changes that trap the hair. Infection can result from tissue irritation and bacteria introduced by the trapped hair. Most follicular infections are caused by Staphylococcus pseudintermedius, but they may be caused by other species of staphylococcus, or by streptococcus or pseudomonas bacteria. These bacteria do not normally grow on a dog's skin, but are naturally present on dog fur. When they get underneath the skin surface, they cause infection, which leads to pus-filled packets inside the hair follicles. In rare cases, swollen, pus-filled follicles are caused by other types of bacteria, autoimmune disease, or an allergylike sensitivity to normal bacteria or yeasts on the skin or hair. Some types of dogs are especially prone to of the hair follicles, including spaniels, setters, retrievers, hounds, schnauzers and poodles. Dogs who are shaved are at greater risk of developing ingrown hairs. Ingrown hairs are more likely on areas with prior skin damage. 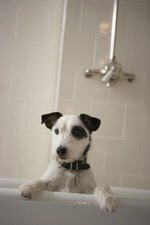 Overbathing and improper grooming techniques increase the risk of ingrown hairs and bacterial folliculitis for dogs of any breed. Individual dogs may be genetically predisposed to these conditions. Ingrown hairs often present as swollen, red, pimplelike bumps, which develop into pustules that reveal the long, trapped hair when burst. However, they can appear as a variety of skin irritations, including crusty areas or bumpy, bald patches. As ingrown hairs can develop on fur-covered areas that are not readily visible, your first warning may come from your pet's behavior. Behavioral symptoms include persistent scratching or chewing at the skin. In dogs with short coats, ingrown hair and folliculitis are commonly found on areas with sparser fur such as the abdomen. In breeds with long, curling hair such as poodles, they can develop anywhere on the body. Chronic or pervasive cases of bacterial folliculitis are usually a symptom of an underlying disease condition, such as hypothyroidism, which is lowering immunity or changing the integrity of the skin. It is important to seek veterinary attention to determine the nature of and treat underlying causes. Diagnosis is made through visual exam and bacterial culture from skin scrapings or pus. A single incidence of ingrown hair may be left alone to resolve on its own, treated with a topical scrub or lanced if severe. More pervasive cases of folliculitis that affect entire patches of skin are treated by oral antibiotics and sometimes by topical antiseptic shampoos, conditioners, creams, lotions, sprays or gels. Antibiotic therapy usually lasts three weeks. Topical therapy typically lasts one week, with weekly applications thereafter.